President Obama caught a little flak when he smacked a fly during a recent press interview in the White House. During the interview, a pesky fly buzzed around his head and then landed on his hand. Big mistake. The commander-in-chief nailed him. The bug stopped there. "I got the sucker," he said. That prompted the People for the Ethical Treatment of Animals (PETA) to protest the fly "execution." And now YouTube, Facebook, My Space, the bloggers and the tweeters are all getting into the act. The President killed a fly. To be honest, I'm not one to participate in a catch-and-release program. However, I do photograph them occasionally. See, there's this forensic entomologist at UC Davis named Robert Kimsey who shows fly images in his PowerPoints. 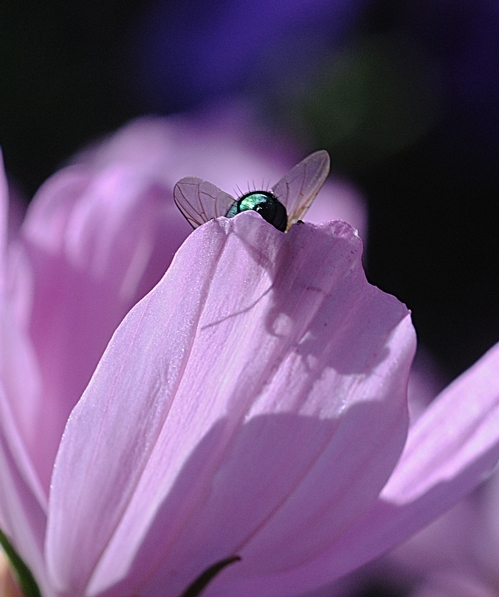 Last weekend I photographed a blow fly that landed on my pink-petaled cosmos. Did it for Bob. Honest. Surely it's true that "You can catch more flies with honey than you can with vinegar" but frankly, I wouldn't waste the honey. Or the vinegar. Or the time. And why would I want to catch flies anyway? The fly is not my favorite pollinator. It's a notorious disease transmitter. 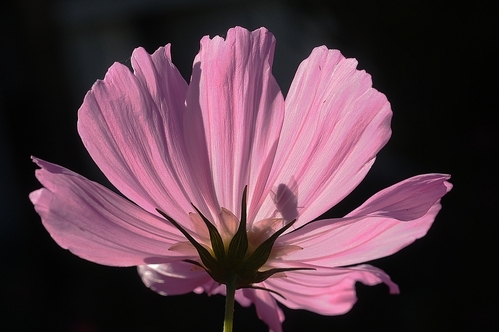 Still, it can be pretty in pink.